At a meeting in June, the African Union (AU) decided to end the suspensions of Egypt and Guinea-Bissau from the regional organization. Egypt was suspended from the AU last year after its elected government was overthrown by the military. Its reinstatement comes after the events of this May, when the country held its first presidential election since the takeover. Guinea-Bissau had been suspended since a 2012 coup, and was similarly allowed back in after holding elections this April. The AU's Peace and Security Council typically suspends member countries when they experience coups or other breakdowns of constitutional rule. Though this is billed as a pro-democracy policy, it does not affect undemocratic governments which are already long-established. After Guinea-Bissau and Egypt's reinstatement, there is currently only one remaining suspended AU member, the Central African Republic (CAR), which is experiencing serious turmoil in the aftermath of an aborted rebel takeover. 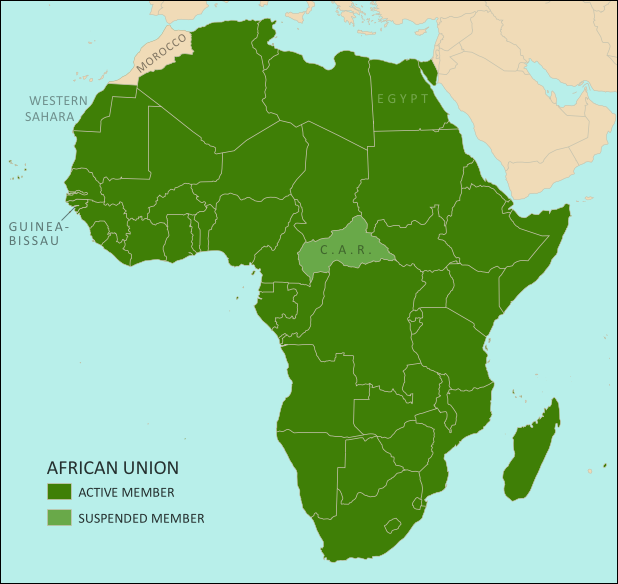 Every UN-recognized country in Africa is a member of the African Union except for Morocco, which withdrew from the OAU in 1984 after the organization chose to admit the partially-recognized state of Western Sahara, a disputed territory which Morocco claims and largely occupies. The only other parts of Africa not represented in the AU are a few groups of offshore islands controlled by European countries, as well the small Spanish enclaves in North Africa. The breakaway Republic of Somaliland is not a member, but is considered by the AU to be part of member-state Somalia.